Three Fat Ex-Packers Linemen Have A Wine Label Called "Three Fat Guys"
What do people in Wisconsin like? Yup, the Packers. And what do people in Wisconsin also like? Yup, alcohol. From that, Three Fat Guys wine was created, "a flavorful collaboration of life, love and laughs — just like us," according to the label. "We're not in it to retire or get rich," Daryn Colledge said. "We're in it to enjoy it." 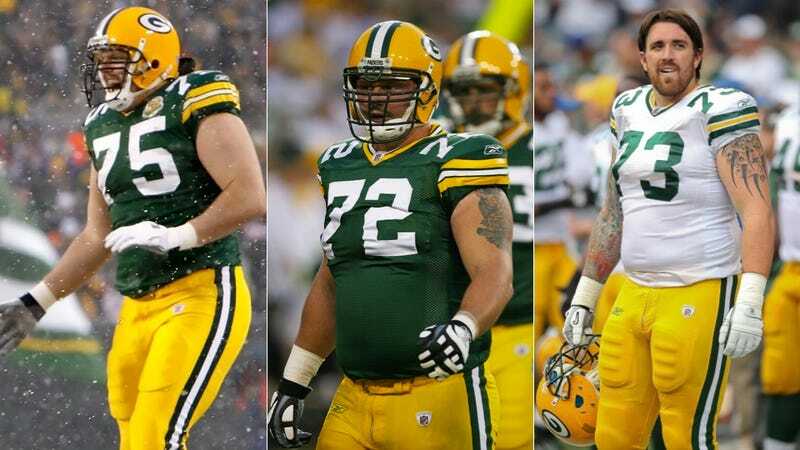 The Three Fat Guys — Colledge, Tony Moll and Jason Spitz — were all drafted by the Packers in 2006. They are all offensive lineman, and together they weigh almost 1,000 pounds. They've all moved on to other teams now: Colledge signed with the Cardinals last year. Spitz is with Jacksonville and Moll joined the Chargers a year ago. But they are still together as friends and business partners, and Three Fat Guys soon will come out with its third vintage of Napa Valley cabernet sauvignon. What a success story in our nation's ravaged economic climate—the stuff now wholesales for $28 a bottle. The fat guys are becoming fat cats.